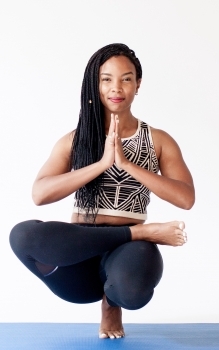 Chelsea Jackson Roberts is an internationally celebrated yoga instructor, educator, and passionate change agent skilled in the art of cultivating community through yoga. With over a decade of teaching experience in both asana and meditation, Chelsea’s unique teaching style makes yoga accessible to a wide range of levels and her balance between sweat and sweet surrender makes her classes a favorite for beginners and regular practitioners. Chelsea’s energetic sequences, dope beats & signature smile have gained the attention of international pop artist Janelle Monáe who practices with Chelsea and recently invited her to join her choreography team because of her musical taste and asana combinations. Chelsea has graced the cover of Yoga Journal and her enthusiastic and inviting way for sharing yoga also prepared her for the opportunity to teach yoga at the White House Easter Egg Roll in 2016. Chelsea received her Ph.D. in Educational Studies with a focus in language, literacy, and culture. Her research within the field of yoga served as the foundation for her current community program for teen girls, Yoga, Literature, and Art Camp at Spelman College. Join Dr. Chelsea Jackson Roberts for an integrative immersion that uses yoga, guided meditation, and reflective journaling to establish clear paths to reveal and move towards our purpose. Chelsea’s unique way of combining guided journal practices and the embodied experience of yoga takes practitioners on a journey that centers our experiences as a way to access our intention and purpose. If you are looking for a reboot in creating, continuing, or shifting the energy needed to accomplish goals, vision, and purpose, this is the perfect space to be. Includes a gentle asana practice that is accessible for all bodies and levels of experience. Please bring a journal. Join Chelsea for a yoga practice that utilizes the breath, reflection and the written word as a path to explore sensation and purpose. Inspired by the community of work of Yoga, Literature, and Art Camp that Chelsea founded in 2013, this class holds space for the practitioners who love journal writing, meeting others across yoga communities, and a good ole-fashioned asana practice that is both accessible and challenging. *This workshop will integrate gentle yoga postures. No prior yoga experience is necessary. All bodies and levels of experience are welcome. Join Chelsea in this workshop created to introduce meditation, breathing exercises, and guided deep relaxation practices to unpack the personal stresses that take us out of alignment within our daily lives and use that knowing as fuel to move deeper into our practice. One of the biggest challenges with starting a meditation practice or attempting to integrate embodied relaxation techniques is relaxing the mind and body enough to begin. Chelsea’s workshops are committed to working with practitioners who are new and possibly overwhelmed by not knowing where or how to begin a meditation practice. Through gentle yoga movements, breathing exercises, guided meditation, and opportunities for reflection, Chelsea’s technique will guide you into sustainable and practical ways to begin a daily meditation practice that will support clarity, and provide ways to harness internal power through the breath. Join Chelsea for a soulful and up-tempo yoga class that is both challenging and restorative. Integrating a diverse range of musical genres that complement the flow of the class, Chelsea’s excitement for curating an experience that uses the body as an instrument to access bliss is what makes her teaching unique and memorable. This class is sure to be your jam if you are looking to release a little steam before moving into a deeply restorative and juicy closing. Have you been longing for a yoga practice that is supportive and deeply reflective? Join Chelsea for an intimate Yoga Nidra experience where she will guide you through a restorative meditation using the breath, relaxation and visualization. This class is for all ages, backgrounds, body types, and levels of experience.